The Hard Rock Hotel Panama Megapolis is set to open in December 2011 in Panama City. The 66-story hotel will have 1,449 rooms, including a whopping 796 suites, some of which will be the brand’s signature Rock Star Suites. Located on Panama Bay, rooms will feature spectacular views of Panama Bay and Panama City. One special feature of the rooms is that guests will be able to create a music playlist all their own through the hotel’s “Sound of Your Stay” music collection. The hotel will host eight restaurants and bars, a club on the 62nd floor, a Rock Spa and a Rock Shop where you can buy Hard Rock-branded gear. The hotel will be the brand’s first hotel in Latin America with the unique “Hard Rock Experience”. The hotel will be connected by a pedestrian sky bridge to Multicentro Mall and the Megapolis Convention Center. It will feature several acres of lush tropical landscaping, a large infinity pool and a luxury Hard Rock Spa. Designed with meetings and conventions in mind, the hotel has 7200 square feet of flexible space for both small and large meetings. The hotel decor will feature authentic memorabilia from the age of rock and more contemporary music. A special service “The Sounds of Your Stay” will enable guests to download a wide choice of music free. “We are proud to launch the first Hard Rock Hotel in a region with a prodigious music culture”. “Bocas Del Toro, Panama - A nature lover’s paradise and one of Panama’s most popular tourist spots, Bocas’ 5,000 residents are still way outnumbered by the surrounding wildlife. Enjoy the town’s laid-back vibe and easy access to the region’s nine major islands, 52 keys and roughly 200 tiny islands. There are two marinas for those who want to explore this archipelago’s treasures. And reader Dan Cranney reminded us that “this island archipelago off the Caribbean coast of Panama is one of the few hurricane-free places in the Caribbean. The newest Marina is at Red Frog and it’s a beautiful setting with plenty of nearby amenities. Thanks to the Tico Times for this information. Panamanian President Ricardo Martinelli says his nation has made enormous strides in the fight against corruption, crime and drug trafficking in the two years since he took office. Speaking to a packed crowed the day after meeting with U.S. President Barack Obama at the White House, Martinelli said his no-nonsense “law and order” approach has yielded impressive results. Martinelli was visiting the United States in order to urge the White House and Congress to push for a free-trade agreement between the two countries, which – if passed – would dramatically increase U.S.-Panamanian trade and attract foreign investment, he said. The president boasted that his government has cracked down on price-fixing, illegal kickbacks, tax fraud and corruption within Panama’s police force – a problem that seems to have grown with the arrival of thousands of foreign workers taking advantage of Panama’s rapidly expanding economy, which grew 9 percent last year. Now, he said, visitors are permitted to stay in Panama for up to 180 days before having to renew their visas. The fact that Panama shares a jungle border with Colombia – the world’s largest source of cocaine – makes it Central America’s first line of defense against drug traffickers. Martinelli, whose five-year term of office expires in mid-2014, said Panama now ranks as the second-most competitive economy in Latin America after Chile, and is one of the few countries in the region with investment-grade bond ratings. As such, expanding Panama’s service-based economy is a top priority for his administration – and the planned $5.3 billion expansion of the Panama Canal will pump tens of billions of dollars into the country in coming decades. At the same time, a dramatic increase in tourism – two million foreign visitors are expected to visit Panama this year – has generated revenues to pay for badly needed improvements, including an expansion of Panama City’s Tocumen International Airport. Asked about potential terrorist attacks against the Panama Canal, Martinelli does not appear to be losing much sleep over that issue. This article came out awhile ago but is one of the best about Panama today. PANAMANIANS joke that the McDonald’s franchises and glass skyscrapers make Panama City the “Miami of the South,” except that more English is spoken here. But more than a decade and a half after an American invasion leveled part of the city and about six years after United States troops pulled out of the country and ceded control of the Panama Canal, the city is asserting itself as a tourist destination, not just a scenic overpass for an engineered waterway. Fashionable hotels now dot the cosmopolitan skyline. Crumbling colonial homes are being polished into bohemian gems. Emerald rain forests woo eco-tourists. There might even be a Frank Gehry-designed museum in the future, with the hope of sparking a so-called “Bilbao effect” for the port of Balboa. For now, anyway, Panama City hasn’t been overrun by tourists. But with daily direct flights from about six cities in the United States, including New York, Newark and Los Angeles, that might not last. Go back to the future with a stroll through the cobblestone alleys of Casco Viejo, a colonial-era neighborhood frequented by snow-cone vendors. Abandoned by the city’s elite in the 1950’s, the area became a squatters’ slum. In recent years, however, artists, professionals and snowbirds have turned skid row into real estate gold. Among the prominent residents is Rubén Blades, the musician and actor who is now the country’s minister of tourism. Take a taxi to the Plaza de Francia, at the peninsula’s tip. From there, you can walk to the Golden Altar at the San Jose Church (Avenida A and Calle 8a Este), one of the few treasures that wasn’t ransacked by Henry Morgan, the pirate captain, in 1671; the heron-infested presidential palace (Avenida 4 and Calle Eloj); and the slick if encyclopedic Interoceanic Canal Museum (Plaza de la Independencia, 507-211-1649). For Panamanian cooking (similar to Cuban with a lot of seafood), try Tinajas Restaurant (22 Calle 51, 507-263-7890) in El Cangrejo, the central banking district. National staples like corbina ceviche ($4), jumbo shrimps in coconut sauce ($12.50) and ropa vieja ($7.50), spicy shredded beef over rice, are served accompanied by live folkloric dancing in a homey atmosphere. The costumed dance begins at 9 p.m. on Tuesdays, Thursdays, Fridays and Saturdays. Like South Beach in Miami, Panama City has its share of velvet ropes, although the lower model quotient provides for less attitude. Many doors don’t open until 11 p.m., so for a preclub cocktail drop by the Martini Bar at the Radisson Decapolis Hotel (Avenida Balboa, 507-215-5000) and watch the city’s peacocks preen on bright orange sofas. 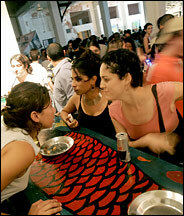 After a martini ($6 to $9) or two, many head to nearby Calle Uruguay, where there are no fewer than a dozen hot spots catering to straights, gays, punks and fashionistas. At Moods (Calle 48 and Calle Uruguay, 507-263-4923), the stiletto-heeled and open-collared partygoers grind their hips to Panamanian reggae until dawn. Suppress your urge for an Egg McMuffin and nurse your hangover at El Trapiche (Vía Argentina, 507-269-4353), a busy diner in El Cangrejo, for a hearty breakfast of carimañola, a savory roll made of mashed yucca and stuffed with ground beef and boiled eggs, and a side of corn tortillas, which look more like silver-dollar pancakes than taco shells. The bill should come to under $8, even with a second café con leche. No trip to Panama City is complete without a visit to the Panama Canal. Instead of standing around in your fanny pack, have lunch at the Miraflores Locks, the southernmost of three sets of water elevators that fill and drain as ships wend their way between the Pacific and Atlantic Oceans by way of the Caribbean Sea. Just five miles from the city’s center, the new Miraflores Visitor Center (507-276-8427) is home to a multilevel exhibition and a third-floor restaurant (507-232-3120; shown top left) where you almost touch the passing vessels while you refuel. To ensure a choice table, call the restaurant for reservations (the lunch buffet is $17); you can also call the center for the day’s scheduled crossings. To complete your self-guided tour, go halfway up the 50-mile-long canal to the Gamboa Rainforest Resort (507-314-9000), a 340-acre nature reserve complete with an aerial tram that slices through the Soberanía National Park, a Tarzan-like jungle that is home to a staggering 500-plus species of birds. An observation tower offers another bird’s-eye view. Situated 30 minutes from the city center, the resort is as idyllic and unspoiled as downtown Panama City is hurried and urban. As the day wanes, there’s no better place to rejuvenate than the mile-long Amador Causeway, which juts out between the canal and Panama Bay. Made from rocks excavated from the channel, the three connecting islands form an esplanade of parks, cafes, oceanfront condos and a new cruise ship terminal. By day, bicyclists ride and joggers stride along the narrow roadway, soaking in the dazzling views of the city’s crescent-shaped waterfront - a veritable timeline that spans from 17th-century steeples and fishing nooks to modern office towers and airy penthouses. By night, the distant skyline comes alive like twinkling stars. For a memorable meal, take a cab to Eurasia (Calle 48, 507-264-7859) in the busy central district of Bella Vista. Reflecting the city’s immigrant stew, this Chinese-owned restaurant marries local ingredients with French techniques and Asian flavors. Favorites include a gravlax timbale filled with a passion fruit-cured ceviche ($12.50), and cornmeal-encrusted prawns in a tamarind and coconut sauce ($15.50). The stately dining room has marble floors and handsome artworks that evoke a colonial manor. La Casona de las Brujas (Plaza Herrera) is one of the trendy lounges and cafes that have sprung up in Casco Viejo. If you still have the energy, pop back to the causeway, to the Fort Amador Resort and Marina, located at its tip. For a civilized nightcap, head to the bar at Café Barko (507-314-0000), where the crowd ranges from fun-loving locals to chatty cruise passengers. Should a second wind strike, there are several dance clubs in the entertainment complex, including Alcatraz, a popular nightclub for well-heeled club kids. History buffs won’t want to miss the tombstone-like ruins of Panamá Viejo, the original 1519 Spanish settlement sunken along the eastern fringes of the modern city. A Unesco World Heritage Site, its stumpy walls resemble a sprawling Central American Stonehenge. When your camera runs out of memory, check out the nearby artisanal market for last-minute souvenirs. Direct flights from Newark Liberty International Airport to Panama City take about five hours. Tocumen International Airport is about 12 miles northeast of the city center, reachable by taxi for about $25 (the United States dollar is used in Panama). Although there are buses, routes are not clearly marked. Taxis are cheap and should run under $5 for most trips. If you find a driver you like, consider hiring that person for as little as $40 for part of the day.